Bike Pic Dec. 11, ice cream smiles Friday! 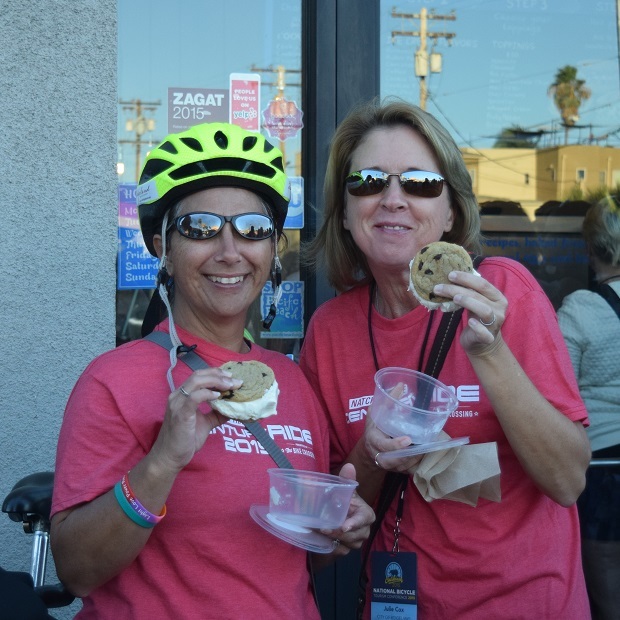 Here two two cyclists above, Wendy Bourdin and Julie Cox who are both from Ridgeland, MS., find a rest stop that makes and serves ice cream sandwiches the old fashion way. 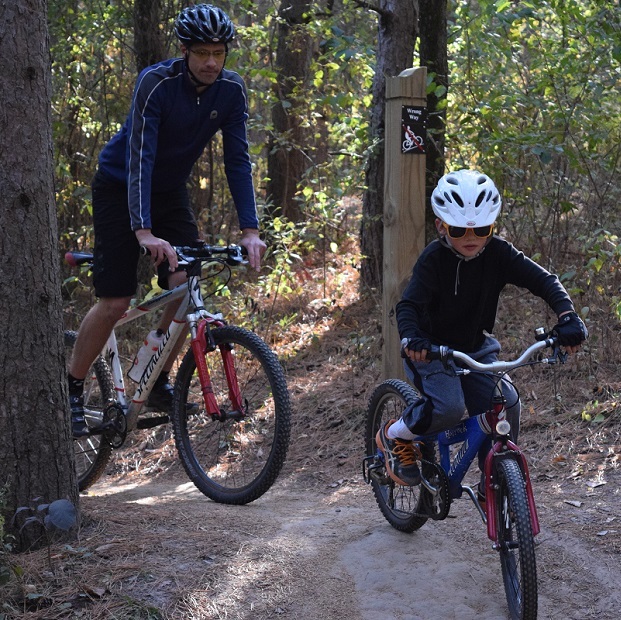 For a great bike adventure, check out Ridgeland’s multi-use city trails system that connects to the Natchez Trace Trail. 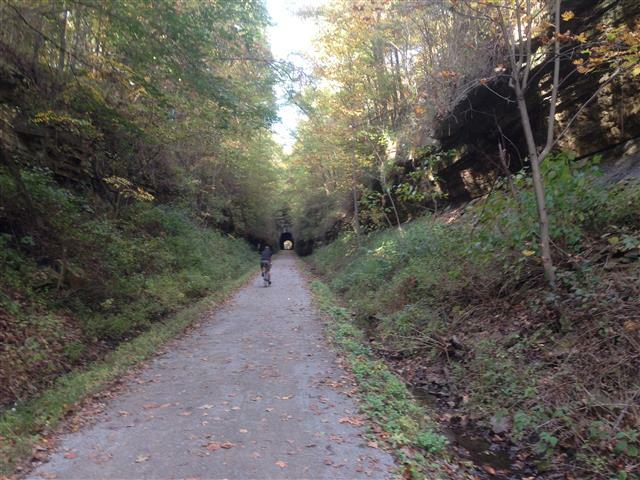 This entry was posted in News and tagged #FindYourNextAdventure, Bike Trail riding, biking Ridgeland, Ice cream smiles, Natchez Trace Trail system on December 11, 2015 by Russ Lowthian. Riders on the MRT (Mississippi River Trail) after passing under the Hwy 169 Bridge, in Champlin, Minn.
Part of the 2014 Train and Trail Ride, hosted by the Bicycle Alliance of Minnesota. 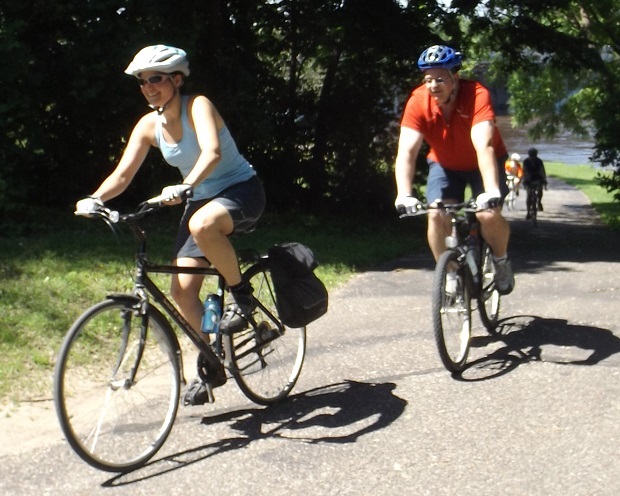 Sorry, this year’s event is sold out, but you can explore the route by boarding the North Star Train, with your bike, up to Big Lake, Monticello or Elk River and riding back to Minneapolis. This entry was posted in News and tagged Bike Trail riding, MRT ride on June 16, 2015 by Russ Lowthian. Last year I did a three-day tour around southern Illinois and southeast Missouri. It was beautiful fall weather and a great ride with six friends. Our path included 45 miles on the Tunnel Hill State Trail in Illinois, one of the many terrific rail-trail conversions in the United States. The most exciting and memorable segment however, took place in Chester, Ill. Chester sits on a bluff high above the Mississippi River, and is best known for being the birthplace of the creator of Popeye, the spinach-eating sailor from the cartoons. We were eating lunch when one of the locals offered us a shortcut to get to the road along the river, a smooth, flat road with very little traffic. It would be a nice alternative to the busy two-lane state highway. Now in hindsight that part about the prison should have been sufficient reason to stay with our original route. But we followed the directions to Menard State Penitentiary and found the ‘short cut’ which sure enough, looked like a bike path. We turned in and zoomed through a big grassy field down a huge hill back toward the river. Soon however, the path swooped suddenly right into the prison complex. We were riding alongside the fence of the main jail (where we were close enough to say “hi” to the prisoners inside) and as we passed one of the towers, the guard up inside spun around, then picked up a phone and shouted something into it. We then passed another guard leaning against a truck watching a crew of inmates cutting grass. He turned agitated too and we had a strong feeling that maybe we were somewhere we should not be. But soon enough we passed through another gate, went out a far parking lot and were gone. As we made our way down the river road, not long after that a van from the pen came roaring past us, pulled up in front of us and waved us over. A guard was driving and he was somewhat irate. Asked us where we’re from and what we were doing on prison property. We should not have been on that road, he said, and that it created quite a stir inside. We explained what happened, and he said the people in town probably meant a road that was farther down from the one we took. We were very polite and apologetic, and the guard’s demeanor changed just a bit. He wasn’t quite smiling by the time we were done, but let us go with a warning to do that again. So, next job application, if it asks if I’ve been in prison, do I have to tell them this? This entry was posted in News and tagged Bike Trail riding, Rails to trail experience on February 6, 2015 by Russ Lowthian.